I’m not a big fan of tablet style PCs or at least those that come much bigger than Apple’s iPod touch, which is an Internet tablet disguised as a portable media player if there ever was one. However, others feel differently – just witness the excitement over the upcoming CrunchPad. Yesterday, Archos threw its latest hat in the ring, announcing a yet-to-be-released 9 inch tablet-style “Mini-PC”. Under the hood the Archos 9PCtablet is essentially a Netbook – Intel Atom processor etc. – that adds a 9 inch resistive touch screen and does away with the hardware keyboard. Most promisingly, the on-screen virtual keyboard looks both responsive and, thanks to the luxury of a 9 inch screen, large enough to be used comfortably for replying to quick emails and certainly entering in URLs when browsing etc. My favorite feature of the Archos 9, however, is the simple but brilliant kick stand that can be adjusted to several angles and addresses my biggest complaint about large tablet devices: the need to be supported by a hand or two, making them potentially uncomfortable for prolonged use. With the kick stand in use, the device turns into a very capable media player/Internet TV or coffee-table surfing station, and with the addition of a USB keyboard, can also double up as a traditional PC. 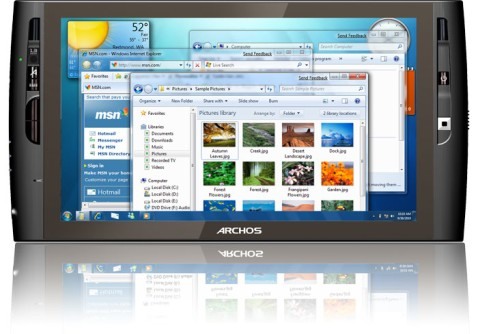 OS-wise, the Archos 9PCtablet runs Windows 7. This is the future of the Wi-Fi photo frame. I'm dying to see someone execute this well… and offer it at a reasonable price.